PM Modi described the health insurance scheme as the world's largest social security scheme. New Delhi: Prime Minister Narendra Modi today described "social justice" as his government's key motto, saying initiatives announced in the Union Budget showed it did not merely talk about welfare of the weaker sections but also worked to implement it. Addressing MPs at a BJP Parliamentary Party meeting, PM Modi asked them to go to the masses to highlight the budget's pro- people measures, terming it an "historic document" to fulfil his government's aim of 'sabka sath sabka vikas' (With all, development for all), Union Minister Ananth Kumar told reporters. The prime minister asked the MPs to take the welfare programmes to the needy and not confine themselves to merely cutting ribbons, an MP, who was present in the meeting, said. He asked MPs to travel across their constituencies in the next few days before Parliament meets next week and interact with people in not "technical" but simple language. PM Modi cited the example of veteran BJP MP Hukumdev Narayan Yadav, who is known for his earthy communication skills. Calling budget a "festival" for the government, he asked law-makers to connect with the people. He spoke about 'Ayushman Bharat', which envisages health insurance for over 10 crore poor families, 'Ujjwala yojna', 'Swachh Bharat' and other initiatives like opening more hospitals, medical colleges and educational centres to stress the budget's pro-poor credentials. He described the health insurance scheme as the world's largest social security scheme. "Our government does not merely talk about social justice but also executes it," he said, adding that people should be informed about how the government is spending more and more money on education and health sectors. Social justice has traditionally been a political plank of socialist and the Left parties. The prime minister said his government has constructed more than six crore toilets, calling them 'izzat ghars' (symbol of honour). They are not only toilets but are a symbol of women's respect and their empowerment, he said, according to Mr Kumar. 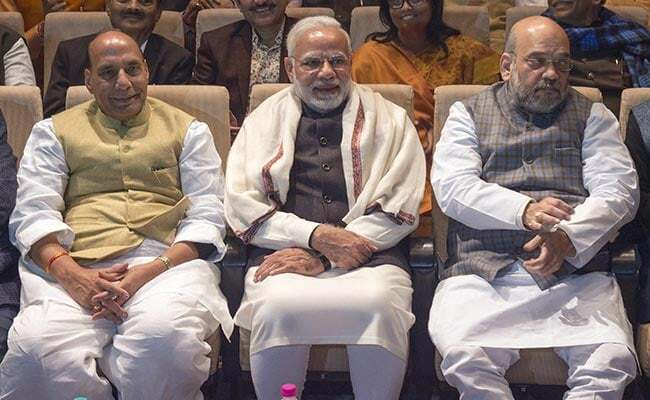 BJP chief Amit Shah heaped praise on PM Modi and Finance Minister Arun Jaitley for the budget which, he told MPs, is "pro-farmers and pro-poor with a lot of scope for employment generation". Mr Jaitley also briefed the MPs about the main highlights of the budget while Rail Minister Piyush Goyal briefed them about PM Modi's visit at World Economic Forum meeting in Davos.